Kitzbühel's charming medieval centre makes for a pretty addition to one of Austria's top ski resorts. It's one of the best not only for skiing, but also for restaurants, après-ski, and for off slope activities. With a wide range of accommodation on offer, the best places to stay in Kitzbühel should suit most budgets and tastes, and make ideal bases whether you're here for the winter sports or summer activities. Kitzbühel has two main ski areas, the famous Hahnenkamm, which is right above the town, and known for one of the world's best downhill ski races, and the Kitzbüheler Horn area which is smaller. The entire domain boasts a total of 170km of prepared pistes, and there is plenty on offer if your prefer a snowboard to skis. In the summer months Kitzbuhel is transformed into a pretty Tryolean town, with flower filled meadows and stunning mountain views. But adrenalin junkies won't be disappointed, there's plenty going on here when the snow has gone: around 1200km of walking and hiking routes, miles of cycling trails (some not for the faint-hearted) and climbing on the Wilder Kaiser and other glacial mountains in the area. For those who prefer their sport slightly less extreme, Kitzbuhel is a mecca for golfers in the summer season, with four courses in the town alone, and thirty more in the surrounding area. During the summer months head off hiking around the beautiful Schwarzsee lake. Set amidst stunning natural scenery, it's a wonderful place to enjoy a picnic with the whole family before enjoying a refreshing dip in the water! Museum Kitzbühel, whilst not being that large, houses a lovely collection of artefacts (with some even dating from the Bronze Age!). There are a number of special displays on skiing, as is to be expected, as well as a modern history section including details on the town's Nazi occupation. A fascinating way to spend a few hours. Pass by the Franziskaner Der Immakulata Church, with beautifully Baroque interiors including an ornate altar as well as intricate stained glass windows and chandeliers. Don't forget that if you're planning a skiing holiday, the best places to stay in Kitzbuhel will be incredibly busy over Christmas, New Year, February half term and Easter. So either book well ahead, or try to arrange your stay over the quieter periods. Kitzbühel's historic Tirolean centre is pretty and pedestrianised, with plenty of nice boutiques to poke around in and cafes to people watch in. On race weekends the town is packed with around 70,000 spectators, so there's a lot of life! 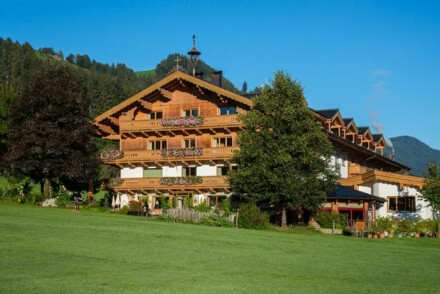 If you're looking for five stars worth of alpine splendour that won't break the bank, the Weisses Rossl is one of the best places to stay in Kitzbühel for you. It looks traditional from the outside, but its luxury is unfussy and elegant inside. Plus there's a lovely spa, grand public areas and a gourmet restaurant. 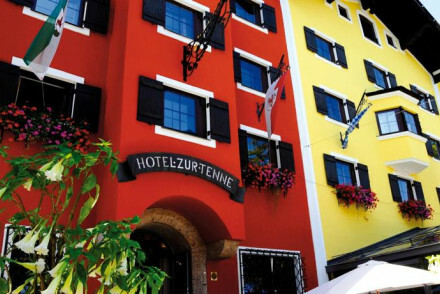 A brightly painted traditional townhouse right in the centre of Kitzbühel, the Hotel Tiefenbrunner manages to be both big and cosy. It's also only five minutes from the main lifts, and the restaurant has wonderful views of the mountains. Hotel Zur Tenne is located in the historic heart of town. Its spacious rooms feature plenty of wooden furnishings and are extremely cosy, with working fireplaces that are perfect for chilly evenings. Plus, there's four restaurants to choose from! 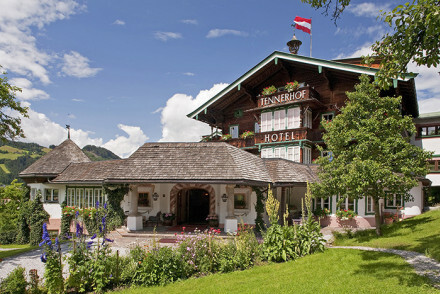 It looks a bit like one of those beautiful cuckoo clocks, and, with its views over the town and the mountains, the Hotel Tennerhof is just as charming inside as it is out. It has just 16 rooms and 19 suites, so a good option if you're looking for somewhere intimate. The spa is good, but the hotel restaurant is regularly referred to as one of the best in the world. 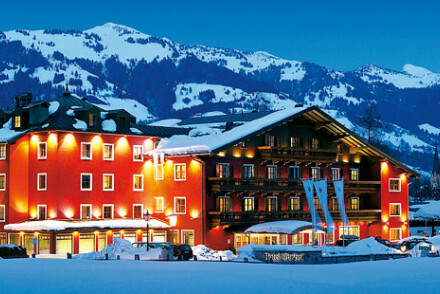 So it's probably an understatement to say that this is one of the best hotels in Kitzbühel for foodies. And if you're skiing all day you can't help but build up an appetite. The Alpeniglu Village offers a totally unique experience, an opportunity to stay in an igloo. So if you're looking for a reason to cosy up together this is the one to book. Rooms are in separate igloos, filled with furs and down sleeping bags, and the main building is also made of snow and ice - including the bar and restaurant. Hotel Erika, set in a gorgeous Art-Deco building surrounded by fantastic gardens (to be enjoyed in the summer), is a lovely stay. Boasting traditionally elegant accommodation with mahogany furniture and paintings, there's Austrian cuisine served in the restaurant and an extensive spa. 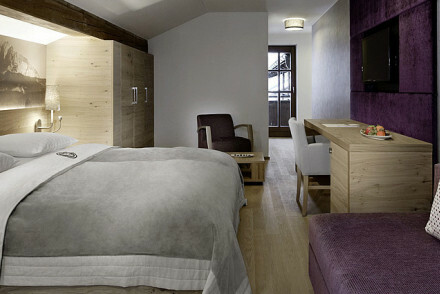 Hotel Del Bär is a stylish contemporary spot offering chic, typically Alpine accommodation. With an award-winning restaurant and stunning views, it's a lovely romantic stay. Hotel Rasmuhof is a luxury alpine lodge set in a secluded area. Offering large rooms with exposed beams and floor to ceiling windows, there's also a lovely restaurant specialising in local dishes and pampering spa services. 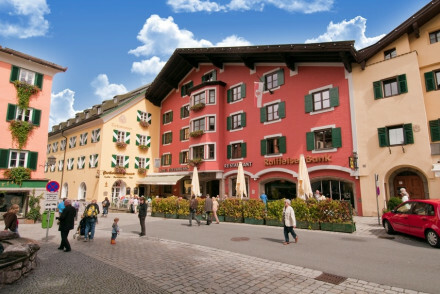 Kitzbühel is pretty spread out, so you need to choose your hotel carefully. But as long as you do that you and your family should be laughing - the largest local ski school takes students from age three! While your kids may think they'd like to stay in an igloo, they may actually prefer the Villa Licht. It looks like a Christmas decoration, with its traditional chalet style exterior, and inside the rooms, suites and family sized apartment have every comfort. Plus, it's only minutes from the main lifts. The Hotel Erika is a stylish option, with a huge garden, making it a great Kitzbühel base for families visiting in the summer months. The building is striking: Art Nouveau, and painted a terracotta colour which looks spectacular in the snow. 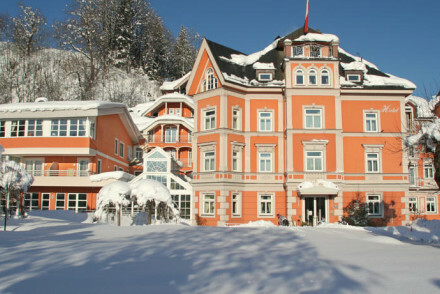 The rooms and suites are decorated in a traditional style and the restaurant serves traditional Austrian food. It's very welcoming, but also very pretty. Cordial Sporthotel offers smart, unfussy accommodation as well as family suites. Come back after a day on the slopes and unwind in the spa before enjoying a meal at the cosy restaurant. What's more, there are a number of activities for the kids to get involved with. 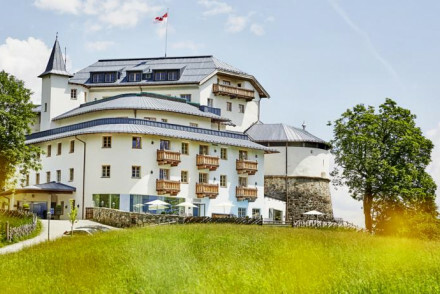 If you're here for the golf, the Grand Tirolia Kitzbühel is one of the best places to stay in Kitzbühel. This five star resort has one of the most beautiful 18 hole golf courses in the world, and if you're here to ski there's plenty of that as well. The decor is a charming blend of old world and new design, whilst there's an excellent spa and gourmet restaurant. If you like your luxury modern then the Hotel Schwarzer Adler would be our recommendation. It's got a stunning rooftop pool, a super modern spa and all of the 88 rooms and suites are resplendent with modern gadgetry. The traditional hotels just can't compete. Biohotel Stanglwirt is a five star chalet offering spacious rooms featuring plenty of pine wood furniture and creamy furnishings - typically Alpine in style. With no less than six restaurants, indoor and outdoor pools, a spa (with a range of saunas) and a driving range, this is the ultimate luxury escape! 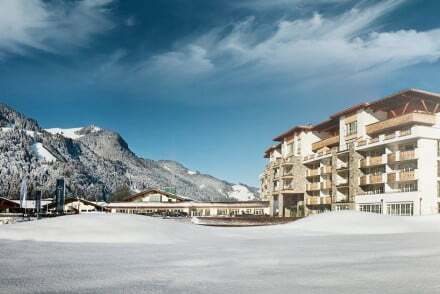 Hotel Kitzhof Mountain Design Resort is a chic spot providing contemporary accommodation. Boasting a selection of gourmet restaurants and a spa to unwind in after a long day, it's a top choice. 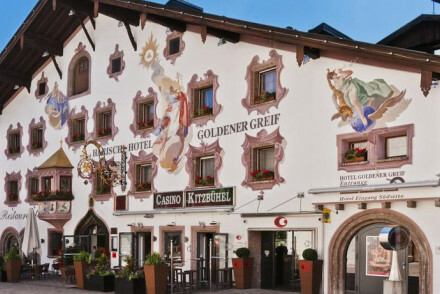 Hotel Goldener Greif is a luxurious stay set in an historic building. Its smart rooms boast traditional wooden features and there's an atmospheric bar to relax in after a long day on the slopes. The smart Hotel Rosengarten offers chic accommodation with polished wood floors, French doors and crisp white linen. Enjoy wonderful meals from their award-winning restaurant and indulge yourself in their spoling spa after a day out skiing or hiking. Those travelling to Kitzbühel for the skiing can visit anytime from October to March, with there being an average 200 days of skiing per year! Be warned though that prices will be higher around Christmas time, so it may be best to visit towards the end of the season - when the snow's still surprisingly good, (some say March is best), and the pistes are nice and empty. That said, if you fancy a bit of a buzz when you visit then be sure to come around the end of January when the annual Hahnenkamm Race is held. If you're flying in from abroad, the nearest options are Salzburg Airport (74km away) and Innsbruck Airport (97km away). From Salzburg, take the bus towards Lofer Tourismusverband, then onto St. Johann in Tirol Bahnhof and then to Kitzbühel Griesgasse. This journey should take abour 2 hours 20 minutes. If you rent a car and drive, however, the journey time will be cut in half. From Innsbruck, hop on the bus towards Innsbruck Hbf, then on a train to Wörgl Hbf, and finally onto another train towards Kitzbühel Hahnenkamm. This takes around 2 hours 44 minutes. 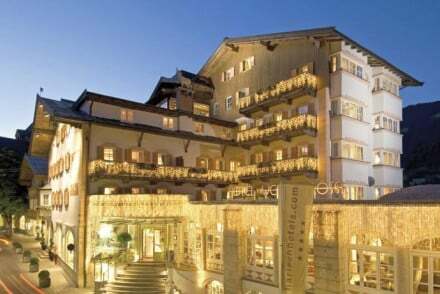 Browse through our list of all the best places to stay in Kitzbühel. 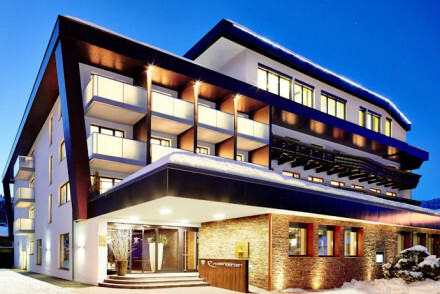 Widen the net and browse through our list of the best places to stay in St Johann In Tirol. Or, call or email one of our gurus for advice. A luxury family-run hotel in a historical building. Spacious, yet warm, individually styled rooms boast superbly comfortable beds, traditionally inspired wooden features and luxurious bathrooms. An atmospheric bar is the ideal place to while away an evening. Easy access of the slopes. Fabulous. Skiing - Just 5 minutes from the nearest cable car. The resort offers pistes for all abilities. Active Holiday - A luxurious base to return to after a day in the mountains. A very sporting hotel in the town centre. Well equipped for winter and summer, very family friendly apartments and suites, traditional in style. A great no frills choice for families, groups and sportsmen. Skiing - All main lifts are very close by. A Five Star resort on one of the most beautiful 18 hole golf courses in the world. Fantastic designer rooms and suites combine the old and new for chic effect. Excellent spa and gourmet restaurants. A luxury choice for the avid sportsman. Golf - Located in the heart of the Eichenheim golf course one of Europe's nicest. Views - Wonderful views over Kitzbuhel and the surrounding mountains. A luxury property boasting an enviable location with gorgeous mountain views. Tradition meets modernity throughout; think plenty of pine set against large glass walls and clean lines. Superb cuisine served in historic surrounds. An extensive spa is completely spoiling. Highly recommended. Skiing - Just a five minute drive to the Panoramabahn Cable Car and the Kitzbühel Alps Ski Area. Total relaxation - Find complete luxury in beautiful surrounds; from spa to design this hotel is spot on. Active Holiday - The surrounding mountains offer endless sporting activities. 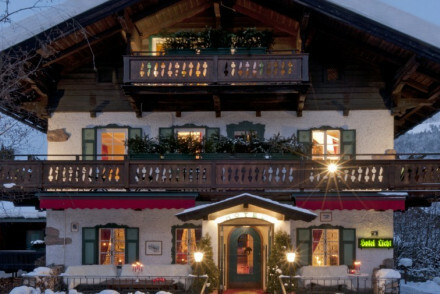 Lovely traditional townhouse hotel in the centre of Kitzbuhel. Beautiful garden and terraces, indoor pool and spa, excellent restaurant with views of the mountains. Cosy rooms and suites with four poster beds and private balconies. A great choice for families and romantic breaks in summer or winter. Skiing - 5 minutes walk to the main lifts. Five Star mountain splendour in traditional elegance. Fantastic rooms and suites, some with private spas and private balconies. Gourmet fine dining restaurant, beautiful spa, and grand living areas with frescoed ceilings. A regal mountain holiday. Fabulously modern hotel in the town centre. Stunning roof top pool, spa, and award-winning restaurant. Very contemporary rooms, suites, and family suites have all the modern gadgetry, private balconies, and some have private saunas. A hotel with wow factor. Foodies - Award winning restaurant "Neuwirt" located next to the lobby. A quaint traditional property in the heart of the historic town. Atmospheric rooms are well proportioned yet cosy with working fireplaces and softly patterned fabrics. A choice selection of four restaurants serving regional cuisine. Close to the town's attractions and brimming with Tyrolean charm. Local exploring - A traditional property in this historic town. Well located with many of its sights within walking distance. A smart contemporary hotel boasting both an excellent restaurant and spa. Oh-so-chic rooms are cleanly designed with a modern take on Alpine design; think polished wood, french doors and crisp white linen. The restaurant alone makes this worthy of a visit. A truly indulgent stay. Total relaxation - The ideal spot to unwind with indulgent in room tubs and a spoiling spa with extensive therapy list. Foodies - Dine in the multi-award winning restaurant run by the famed Austrian chef Chef Simon Taxacher. Cooking classes - Love the food? Learn to whip up your favourite dishes from the menu in the in house cookery school. Five Star mountain elegance with an award-winning restaurant and fabulous spa. Romantic bedrooms and suites have antiques, four poster beds, high ceilings, private balconies. Spectacular views over the town. Classical and luxurious. A luxury alpine lodge sitting pretty in a secluded spot. Large rooms feature private terraces, floor to ceiling windows and exposed beams. The popular restaurant serves up local delicacies alongside an excellent wine-list. Both skiing and golf are available right on your doorstep. Fabulous. Romantic Break - The ideal couples retreat, with pampering spa services, a sauna overlooking the mountains and elegant comfortable suites. Super chic Four Star design renovation. Contemporary interiors blend traditional Alpine motifs to luxurious effect. Seamless bedrooms and suites have wooden walls, lots of natural light and private balconies. Selection of gourmet restaurants and excellent spa. Year round luxury on a grand scale. Foodies - A selection of excellent restaurants. A striking Art Nouveau building with gorgeous gardens, fantastic spa, and elegant interiors. Traditional bedrooms and suites have mahogany furniture and paintings. The restaurant serves authentic Austrian cuisine. A romantic spot, but also very family friendly.